Significant airway remodelling is a major component of the increased morbidity and mortality observed in cystic fibrosis (CF) patients. These airways feature ongoing leukocytic inflammation and unrelenting bacterial infection. In contrast to acute bacterial pneumonia, CF infection is not cleared efficiently and the ensuing inflammatory response causes tissue damage. This structural damage is mainly a result of free proteolytic activity released by infiltrated neutrophils and macrophages. Major proteases in this disease are serine and matrix metalloproteases (MMPs). While the role of serine proteases, such as elastase, has been characterised in detail, there is emerging evidence that MMPs could play a key role in the pathogenesis of CF lung disease. This review summarises studies linking MMPs with CF lung disease and discusses the potential value of MMPs as future therapeutic targets in CF and other chronic lung diseases. Chronic progressive destruction of the lung is the major cause of death in patients with cystic fibrosis (CF) . While gastrointestinal symptoms are treated efficiently by established medications, such as pancreatic enzyme replacement therapy, the progression of pulmonary symptoms with destruction of pulmonary tissue cannot, as yet, be controlled sufficiently. CF airways are characterised by airway surface liquid (ASL) depletion producing mucus obstruction and chronic inflammation with persistent leukocyte accumulation, mainly of neutrophils and macrophages. Despite the presence of millions of activated phagocytes, bacterial pathogens such as Pseudomonas aeruginosa, Staphylococcus aureus and Haemophilus influenzae flourish in the CF airway microenvironment, resulting in chronic infection. Since recruited leukocytes are impaired in their antibacterial capacity due to decreased mucociliary clearance , CXCR1 receptor cleavage , excessive but inefficient neutrophil extracellular trap formation  and other mechanisms, dehydrated mucus and extracellular DNA obstruct the airways and other toxic products, such as proteases and oxidants, cause host tissue damage. Major proteases in this disease situation are serine proteases and matrix metalloproteinases (MMPs). While the role of serine proteases, such as neutrophil elastase (NE), cathepsin G and proteinase 3 have been characterised in detail in murine and human studies (including natural and synthetic antagonists), there is emerging evidence that MMPs could play a key role in the pathogenesis of CF lung disease. The amount of free proteolytic activity increases over the lifetime of CF patients  and overwhelms the antiprotease shield of the airspaces. These enzymes damage cellular and pulmonary structures, including cilia, elastin, fibronectin, surfactant proteins A and D, immunoglobulins and CXCR1 on neutrophils and CD4 on lymphocytes . This article will introduce the MMP family and will highlight the potential of several members as future targets in CF lung disease. MMPs are one of four subfamilies within the superfamily of metalloendopeptidases known as the metzincins . More than 20 MMPs have been identified and, based on structure and substrate specificity, they are further subdivided into groups. All MMPs exhibit an N-terminal signal sequence, a pro-domain region and an active catalytic domain (with a zinc-binding region). Another major domain observed is a haemopexin-like C-terminal domain (found in all MMPs except MMP-7 and -22), which is thought to mediate substrate specificity of the MMP for components of the extracellular matrix. Additional domains include a transmembrane domain (found in MMP-14, -15, -16 and -24) and glycosylphosphatidylinositol (GPI anchor; MMP-17 and -25), important to cell-bound MMPs. Furin-recognition motifs are seen in multiple MMP isoforms’ pro-domain regions, and type II fibronectin repeats are seen in gelatinase (MMP-2 and -9) catalytic domains. These regions seem to have important implications for the interaction of the MMP with its substrate (reviewed in ). MMPs have the combined ability to degrade essentially all connective tissue components. While MMPs are involved in many normal homeostatic mechanisms, their expression and activity is commonly elevated in conditions where inflammation and tissue remodelling/repair are operative [8, 9]. MMPs are regulated at various points. Transcription-level regulation, through induction by various cytokines such as interleukin (IL)-1 and tumour necrosis factor (TNF)-α, may involve the activation of a diverse group of intracellular signalling cascades (such as p38 mitogen-activated protein kinase (MAPK) or extracellular signal-regulated kinase 1/2 MAPK), leading to activation of nuclear signalling factors such as activator protein-1, nuclear factor-κB, and signal transducer and activator of transcription to induce MMP transcription . Most MMPs are translated to a zymogen (inactive) form. These enzymes have a pro-domain region that is cleaved through a cysteine switch mechanism and is then activated. Activation can be induced by various triggers, including protease-mediated activation (either by another protease or auto-activation by the active form of that MMP), oxidant-mediated activation or matrix-mediated activation. In addition to regulation of activation, there are numerous inhibitors of MMPs. Although tissue inhibitors of metalloproteases (TIMPs) are often thought of as the predominant group of inhibitors for MMPs, they are really the most specific endogenous MMP inhibitors. The majority of MMP-related inhibition in vivo occurs through relatively nonspecific MMP inhibitors such as α2 macroglobulin [8, 11]. TIMPs are a group of four small (20–24 kDa) MMP-specific inhibitors that bind to MMPs in a 1:1 stoichiometric relationship [12–15]. Animal studies, in addition to human studies in adults, support a role for MMPs and an imbalance between MMPs and TIMPs in the pathogenesis of several well-recognised pulmonary disorders, such as chronic obstructive pulmonary disease (COPD) [16, 17] and asthma [18–20]. MMPs perform numerous biological functions, including degradation of matrix components and remodelling of tissues, release of cytokines, growth factors and chemokines, and modulation of cell mobility and migration . Data suggest that dysregulated cellular production, secretion and activation of MMPs, and/or dysfunction of their inhibitors, are involved in pathological conditions within the lung parenchyma. Through degradation of extracellular matrix components, MMPs can destroy the alveolar epithelium, as well as disrupt reorganisation during the repair process [8, 9]. Although previously well-studied in other pulmonary disorders, the role of MMPs in CF lung disease has only recently been emerging and suggests important downstream effects of this proteolytic dysregulation. MMPs were first found to be upregulated in the airways of CF patients in 1995, when Delacourt et al. described the increase of a 95/88 kDa gelatinase isoform (presumably MMP-9) in the sputum of patients with CF lung disease (n=27) compared with asthmatic controls (n=9) with an associated imbalance of TIMP. Since this finding, there has been a burgeoning of MMP literature in CF lung disease, focusing not only on relative protease/antiprotease imbalance but also on the increasing evidence for downstream effects of this proteolytic environment. These potential biological effects with regard to CF lung disease are shown in figure 1. Predicted effects of matrix metalloproteinase (MMP) (depicted as ovals with scissors) activity in the context of cystic fibrosis. a) MMP-2 disrupts chloride (Cl-) current, and inhibition of MMP-2 abrogates this effect. 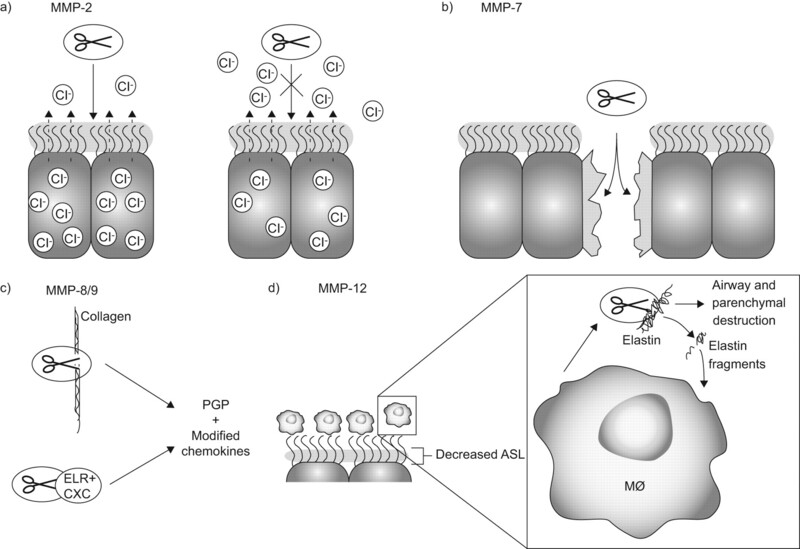 b) MMP-7 functions to repair damage in airway epithelia. c) MMP-8 and -9 are able to cleave collagen and modify ELR+ CXC chemokines, which modulate inflammation in the airways. d) Decreased airway surface liquid (ASL) activates macrophages (MØ) and increases expression of MMP-12, which cleaves elastin, resulting in degradation of the airway and lung parenchyma. These elastin fragments may also increase the recruitment of monocytes and activation of macrophages. PGP: proline-glycine-proline. MMP-2 (EC 3.4.24.24) is a protease with gelatinolytic activity (hence its alternate name, gelatinase A), which is found to be expressed constitutively in various cell types found in the lungs. This enzyme has a broad spectrum of substrates and is involved in modulating diverse cellular functions, including angiogenesis , tissue remodelling  and potentiation of inflammatory response . MMP-2 is activated in a unique membrane-type MMP-dependent manner, demonstrating a classic example of MMP-to-MMP activation . MMP-2 is thought to contribute to the pathogenesis of a variety of pulmonary disorders, including COPD, asthma, lung cancer and interstitial pulmonary fibrosis . MMP-2 has not been extensively studied in CF lung disease but there are some interesting insights into the potential role of this protease in CF. For example, one study has shown that inhibition of MMP-2 in Calu-3 cells (which constitutively express MMP-2) leads to augmentation of chloride transport in these cells, suggesting autocrine regulation of ion transport via this protease . In addition, Geraghty et al. recently demonstrated that NE may augment MMP-2 expression from epithelial cells, potentially leading to increased remodelling and inflammatory response in CF. Interestingly, although MMP-2 elevations have not been consistently observed in pulmonary specimens from individuals with CF [28, 29], a recent manuscript has found that MMP-2 decreases in serum during CF exacerbation . MMP-7 (EC 3.4.24.23), or matrilysin, is the smallest known MMP. It exhibits broad substrate specificity, with the capacity to cleave multiple components of the matrix . In addition, MMP-7 has been observed playing a role in diverse biological responses, such as airway re-epithelialisation, inflammation , host defence  and cell growth via cleavage of insulin growth factor-binding proteins . MMP-7 has been shown to be involved in idiopathic pulmonary fibrosis (IPF), as knockout mice are protected from bleomycin-induced injury  and MMP-7 is overexpressed in lung tissues from patients with IPF . MMP-7 may play an important role in the injury/repair response in CF lung disease. Dunsmore et al. have shown increased MMP-7 expression in the airway epithelia of CF patients, and that it is differentially released either apically or basally from these cells. The authors hypothesise that this regulation is important in the injury response and show that human airways treated with an MMP-7 inhibitor fail to re-epithelialise after injury . To the current authors’ knowledge, specific studies of the importance of MMP-7 expression in CF transmembrane conductance regulator knockout mice after injury have not yet been published. MMP-8 (EC 3.4.24.34), or neutrophil collagenase, is one of three collagenase MMPs (MMP-1, -8 and -13) and is highly expressed in neutrophils. These collagenases have common cleavage sites for type I, II and III collagens, producing a three-fourths N-terminal fragment and a one-fourth C-terminal fragment [38–40]. This suggests a potential redundancy for these proteases in disease. MMP-8 has also been shown to cleave aggrecan in vitro , and may play a role in arthritis . Two specific isoforms of pro-MMP-8 have been described in humans: one, of ∼80 kDa, is highly expressed in polymorphonuclear leukocytes (PMNs); and a 55-kDa isoform is expressed from mesenchymal cells . Beyond the capacity to cleave extracellular matrix, MMP-8 has diverse biological effects, including modulation of chemokines , regulation of repair response  and innate immunity . Increased MMP-8 expression has been characterised in various lung diseases including COPD , IPF , bronchiectasis  and asthma . MMP-8 expression and activity has also been found to be elevated in the airway secretions of patients with CF lung disease . Furthermore, this enzyme is elevated in the serum of patients with CF, and levels correlate with lung function (MMP-8 level versus forced expiratory volume in 1 s (FEV1) % predicted, r= -0.468, p<0.001) . Unfortunately, beyond these characterisations, little else is known regarding the impact of this dysregulation on CF pathogenesis. Recently, a novel neutrophil chemokine (proline-glycine-proline (PGP)) was found in the sputum of CF patients and MMP-8 was found to be an important enzyme involved in its generation . Further examination of the impact of MMP-8 on progression of CF lung disease is certainly warranted. Perhaps one of the most extensively studied proteases, MMP-9 (EC 3.4.24.35), or gelatinase B, is broadly expressed in a variety of cells in the lung, including inflammatory (PMNs, macrophages), epithelial and endothelial cells. This observed redundancy belies important location-specific functions of MMP-9, some of which seem in opposition to other MMP-9 functions. For example, MMP-9 has observed important pro-inflammatory effects by generating PGP  and increasing the chemokine potency of IL-8 , but MMP-9 also plays an important role in the regulation of granuloma formation in tuberculosis . Similarly, MMP-9 had been thought to lead to matrix breakdown, but recently it has been suggested that MMP-9 may have a role in matrix repair [54, 55]. MMP-9 has been extensively examined in the lower airway secretions of CF patients and has been found to be increased in both quantity and activity [28, 50]. One study found a correlation between lung function (FEV1) and MMP-9 (r= -0.78, p=0.001) . In addition, MMP-9 expression is elevated in the serum of patients with CF lung disease . MMP-12 (EC 3.4.24.65), also known as macrophage elastase, is a protease secreted by macrophages with the capacity to degrade elastin. MMP-12 was first cloned by Shapiro et al. . It seems to be subject to partial regulation by proteases, such as thrombin and plasmin, and can be released from macrophages by a variety of inflammatory cytokines, such as TNF-α and IL-1β . This protease has emerging biological effects in modulating cytokine and chemokine networks, including cleavage of pro-TNF-α  and ELR+ CXC chemokines . The physiological role of MMP-12-mediated proteolysis remains poorly understood and may be related to remodelling of connective tissue during growth and development, and migration of macrophages into tissues. Interestingly, recent data have demonstrated that MMP-12 has direct antimicrobial activity and plays an important role in the macrophage-mediated killing of both Gram-negative and Gram-positive bacteria in the lung and other organs . Increased proteolytic activity of MMP-12 has been shown to play an important role in the pathogenesis of emphysema induced by either cigarette smoke  or overexpression of the T-helper type 2 cytokine IL-13 in mice . A recent human study identified a single nucleotide polymorphism producing a functional variant in the MMP-12 promoter that is associated with lung function in asthmatic children and the risk of COPD in adult smokers, suggesting that MMP-12 plays an important role in the pathogenesis of asthma and COPD . Recently, expression of MMP-12 in the sputum of individuals with CF has been demonstrated . The role of increased MMP-12 activity in CF lung disease has not been studied. However, recent observations in transgenic mice with airway-specific overexpression of the amiloride-sensitive epithelial sodium ion channel (βENaC-Tg mice), which exhibit ASL depletion and phenocopy CF lung disease , suggest that airway surface dehydration and mucostasis cause macrophage activation and MMP-12-dependent emphysema . Further elucidation of the role of MMP-12 in the human CF lung should be facilitated by the recent development of fluorescence resonance energy transfer (FRET) probes designed to assess MMP-12 activity on leukocytes and biological fluids . Based on their high sensitivity (with a detection limit in the sub-nanomolar range for human MMP-12), these novel MMP-12 FRET sensors should be suitable to measure MMP-12 activity in clinical specimens, such as bronchoalveolar lavage fluid or sputum, and determine its role in the pathogenesis and as a potential biomarker of CF and other chronic inflammatory lung diseases. As more information has been uncovered regarding the presence and activity of MMPs in CF lung disease, there has been increased interest in modulating MMP activity to improve disease outcome. Evidence supporting the involvement of MMPs in CF lung disease is summarised in table 1. MMP inhibition has been extensively studied as a potential therapeutic pathway in cancer, and although MMP-inhibiting drugs have shown significant promise, two phase III trials have shown no clinical benefit . In addition, an MMP inhibitor (PG-116800) has been studied in post-myocardial infarction cardiac remodelling and has shown no benefit. To date, the clinical use of MMP inhibitors in the setting of inflammatory disorders such as osteoarthritis has been largely disappointing . Unfortunately, the usefulness of many synthetic MMP inhibitors has been limited owing to either off-target effects or intolerable side-effect profiles. Despite the difficulties of translating therapeutic approaches into other conditions, interest has turned to the potential of MMP inhibition in lung diseases such as CF. Various approaches have been studied for the inhibition of MMP activities. TIMPs are naturally occurring inhibitors of MMPs in vivo. While TIMP binding blocks MMP activity, TIMPs themselves can be inactivated by proteases such as NE by direct proteolytic degradation , or by excessive MMP-12 activity . Though this kind of TIMP/MMP dysregulation has been shown to contribute to the pathology of the disease and to correlate to disease severity in animal and human studies, there have not, to the current authors’ knowledge, been attempts to use TIMPs as a treatment for CF. Though TIMPs serve as fairly potent inhibitors of MMP activity, the increased quantities of TIMP required to overcome a pro-proteolytic environment would probably make TIMP therapy cost-prohibitive. As previously mentioned, the current standard of long-term clinical care of patients with CF lung disease often involves thrice-weekly dosing of a macrolide antibiotic . While these antibiotics have multiple biological effects, a potent effect is the inhibition of MMP activities. As yet, tetracycline antibiotics have not been systematically examined for similar anti-protease or anti-inflammatory activities in CF. Previous data indicate that tetracyclines have intrinsic anti-inflammatory properties. Doxycycline, a member of the tetracycline family, is able to reduce neutrophil chemotaxis  and nitric oxide production from murine lung epithelial cells . More pertinently, doxycycline can inhibit MMP synthesis from human endothelial cells . As MMPs have been positively regarded as targets for tetracycline antibiotics in disease , there is increasing interest in inhibiting MMPs using these agents. Recent ex vivo data suggest that this class of antibiotic may effectively reduce MMP activity in CF sputum . A single-centre randomised controlled clinical trial is planned to examine these effects in an adult in-patient CF population in the USA (Clinicaltrials.gov identifier NCT01112059, principal investigator A. Gaggar). Previous articles in this series: No. 1: Löffek S, Schilling O, Franzke C-W. Biological role of matrix metalloproteinases: a critical balance. Eur Respir J 2011: 38: 191–208; No. 2: Elkington PT, Ugarte-Gil CA, Friedland JS. Matrix metalloproteinases in tuberculosis. Eur Respir J 2011; 38: 456–464. This article was supported by the National Institutes of Health (Bethesda, MD, USA; grant no. HL102371-01A1 to A. Gaggar), the Cystic Fibrosis Foundation (Bethesda; grant no. GAGGAR07A0 to A. Gaggar), German Research Foundation (Bonn, Germany; DFG MA2081/3-3 and MA 2081/4-1 to M.A. Mall) and the European Commission (Brussels, Belgium; MEXT-CT-2004-013666 to M.A. Mall).
. Cystic fibrosis. Pediatr Rev 2001; 22: 257–264.
. Reduced three-dimensional motility in dehydrated airway mucus prevents neutrophil capture and killing bacteria on airway epithelial surfaces. J Immunol 2005; 175: 1090–1099.
. CXCR2 mediates NADPH oxidase-independent neutrophil extracellular trap formation in cystic fibrosis airway inflammation. Nat Med 2010; 16: 1018–1023.
. Inhibition of airway proteases in cystic fibrosis lung disease. Eur Respir J 2008; 32: 783–795.
. Structural features of a superfamily of zinc-endopeptidases: the metzincins. Curr Opin Struct Biol 1995; 5: 383–390.
. Structural basis of the matrix metalloproteinases and their physiological inhibitors, the tissue inhibitors of metalloproteinases. Biol Chem 2003; 384: 863–872.
. Extracellular matrix remodelling: the role of matrix metalloproteinases. J Pathol 2003; 200: 448–464.
. Matrix metalloproteinases and the regulation of tissue remodelling. Nat Rev Mol Cell Biol 2007; 8: 221–233.
. Matrix metalloproteinases: molecular aspects of their roles in tumour invasion and metastasis. Eur J Cancer 2000; 36: 1621–1630.
. How matrix metalloproteinases regulate cell behavior. Annu Rev Cell Dev Biol 2001; 17: 463–516.
. Activation of a recombinant membrane type 1-matrix metalloproteinase (MT1-MMP) by furin and its interaction with tissue inhibitor of metalloproteinases (TIMP)-2. FEBS Lett 1996; 393: 101–104.
. The soluble catalytic domain of membrane type 1 matrix metalloproteinase cleaves the propeptide of progelatinase A and initiates autoproteolytic activation. Regulation by TIMP-2 and TIMP-3. J Biol Chem 1996; 271: 17119–17123.
. Membrane-type-2 matrix metalloproteinase can initiate the processing of progelatinase A and is regulated by the tissue inhibitors of metalloproteinases. Eur J Biochem 1997; 244: 653–657.
. Tissue inhibitor of metalloproteinase-2 (TIMP-2) binds to the catalytic domain of the cell surface receptor, membrane type 1-matrix metalloproteinase 1 (MT1-MMP). J Biol Chem 1998; 273: 1216–1222.
. Elevated levels of matrix metalloproteinases in bronchoalveolar lavage fluid of emphysematous patients. Thorax 1997; 52: 502–506.
. Requirement for macrophage elastase for cigarette smoke-induced emphysema in mice. Science 1997; 277: 2002–2004.
. Sputum matrix metalloproteinase-9: tissue inhibitor of metalloproteinase-1 ratio in acute asthma. J Allergy Clin Immunol 2000; 105: 900–905.
. Increased matrix metalloproteinase-9 in the airway after allergen challenge. Am J Respir Crit Care Med 2000; 162: 1157–1161.
. Bronchial subepithelial fibrosis and expression of matrix metalloproteinase-9 in asthmatic airway inflammation. J Allergy Clin Immunol 1998; 102: 783–788.
. Imbalance between 95 kDa type IV collagenase and tissue inhibitor of metalloproteinases in sputum of patients with cystic fibrosis. Am J Respir Crit Care Med 1995; 152: 765–774.
. Modulation of physiological angiogenesis in skeletal muscle by mechanical forces: involvement of VEGF and metalloproteinases. Angiogenesis 2003; 6: 1–14.
. Inhibition of matrix metalloproteinases prevents allergen-induced airway inflammation in a murine model of asthma. J Immunol 1999; 162: 4212–4219.
. Tissue inhibitor of metalloproteinases-2 inhibits the activation of 72 kDa progelatinase by fibroblast membranes. Biochim Biophys Acta 1991; 1079: 242–246.
. Matrix metalloproteinase-2 (MMP-2) and MMP-9 in pulmonary pathology. Exp Lung Res 2005; 31: 599–621.
. Inhibition of matrix metalloproteinase MMP-2 activates chloride current in human airway epithelial cells. Can J Physiol Pharmacol 1999; 77: 529–535.
. Neutrophil elastase up-regulates cathepsin B and matrix metalloprotease-2 expression. J Immunol 2007; 178: 5871–5878.
. Matrix metalloprotease-9 dysregulation in lower airway secretions of cystic fibrosis patients. Am J Physiol Lung Cell Mol Physiol 2007; 293: L96–L104.
. Association of lower airway inflammation with physiologic findings in young children with cystic fibrosis. Pediatr Pulmonol 2009; 44: 503–511.
. Serum matrix metalloproteinases in adult CF patients: relation to pulmonary exacerbation. J Cyst Fibros 2009; 8: 338–347.
. Matrilysin: an epithelial matrix metalloproteinase with potentially novel functions. Int J Biochem Cell Biol 1996; 28: 123–136.
. MMP7 shedding of syndecan-1 facilitates re-epithelialization by affecting α2β1 integrin activation. PLoS One 2009; 4: e6565.
. Regulation of intestinal α-defensin activation by the metalloproteinase matrilysin in innate host defense. Science 1999; 286: 113–117.
. Matrix metalloproteinase-7 degrades all insulin-like growth factor binding proteins and facilitates insulin-like growth factor bioavailability. Biochem Biophys Res Commun 2005; 333: 1011–1016.
. Gene expression analysis reveals matrilysin as a key regulator of pulmonary fibrosis in mice and humans. Proc Natl Acad Sci USA 2002; 99: 6292–6297.
. MMP1 and MMP7 as potential peripheral blood biomarkers in idiopathic pulmonary fibrosis. PLoS Med 2008; 5: e93.
. Matrilysin expression and function in airway epithelium. J Clin Invest 1998; 102: 1321–1331.
. A model for interstitial collagen catabolism by mammalian collagenases. J Theor Biol 1991; 153: 585–602.
. Matrix metalloproteinase-1 cleavage site recognition and binding in full-length human type III collagen. Matrix Biol 2009; 28: 373–379.
. Regulated expression of collagenases MMP-1, -8, and -13 and stromelysins MMP-3, -10, and -11 by human corneal epithelial cells. Invest Ophthalmol Vis Sci 2003; 44: 2928–2936.
. Neutrophil collagenase (MMP-8) cleaves at the aggrecanase site E373-A374 in the interglobular domain of cartilage aggrecan. Biochem J 1994; 304: 347–351.
. Aggrecan is degraded by matrix metalloproteinases in human arthritis. Evidence that matrix metalloproteinase and aggrecanase activities can be independent. J Clin Invest 1996; 98: 2292–2299.
. Matrix metalloproteinases and tissue inhibitor of metalloproteinase-1 in sarcoidosis and IPF. Eur Respir J 2002; 20: 1220–1227.
. Matrix metalloproteinase-8: cleavage can be decisive. Cytokine Growth Factor Rev 2006; 17: 217–223.
. Increased inflammation delays wound healing in mice deficient in collagenase-2 (MMP-8). FASEB J 2007; 21: 2580–2591.
. Matrix metalloproteinase-8 facilitates neutrophil migration through the corneal stromal matrix by collagen degradation and production of the chemotactic peptide Pro-Gly-Pro. Am J Pathol 2008; 173: 144–153.
. Increased activity of matrix metalloproteinase-8 and matrix metalloproteinase-9 in induced sputum from patients with COPD. Chest 2004; 126: 1802–1810.
. Human neutrophil collagenase (MMP-8), identified in bronchiectasis BAL fluid, correlates with severity of disease. Chest 1995; 107: 1641–1647.
. Airway obstruction correlates with collagenase-2 (MMP-8) expression and activation in bronchial asthma. Lab Invest 2002; 82: 1535–1545.
. Matrix metalloproteases in BAL fluid of patients with cystic fibrosis and their modulation by treatment with dornase alpha. Thorax 2002; 57: 930–934.
. A novel proteolytic cascade generates an extracellular matrix-derived chemoattractant in chronic neutrophilic inflammation. J Immunol 2008; 180: 5662–5669.
. Neutrophil gelatinase B potentiates interleukin-8 tenfold by aminoterminal processing, whereas it degrades CTAP-III, PF-4, and GRO-α and leaves RANTES and MCP-2 intact. Blood 2000; 96: 2673–2681.
. Tuberculous granuloma induction via interaction of a bacterial secreted protein with host epithelium. Science 2010; 327: 466–469.
. Epidermal growth factor (EGF)- and scatter factor/hepatocyte growth factor (SF/HGF)-mediated keratinocyte migration is coincident with induction of matrix metalloproteinase (MMP)-9. J Cell Physiol 1998; 176: 255–265.
. Nitric oxide promotes airway epithelial wound repair through enhanced activation of MMP-9. Am J Respir Cell Mol Biol 2007; 36: 138–146.
. Induced sputum matrix metalloproteinase-9 correlates with lung function and airway inflammation in children with cystic fibrosis. Pediatr Pulmonol 2005; 39: 224–232.
. Cloning and characterization of a unique elastolytic metalloproteinase produced by human alveolar macrophages. J Biol Chem 1993; 268: 23824–23829.
. Expression and regulation of matrix metalloproteinase-12 in experimental autoimmune encephalomyelitis and by bone marrow derived macrophages in vitro. J Neuroimmunol 2008; 199: 24–34.
. Tumor necrosis factor-α drives 70% of cigarette smoke-induced emphysema in the mouse. Am J Respir Crit Care Med 2004; 170: 492–498.
. Macrophage-specific metalloelastase (MMP-12) truncates and inactivates ELR+ CXC chemokines and generates CCL2, -7, -8, and -13 antagonists: potential role of the macrophage in terminating polymorphonuclear leukocyte influx. Blood 2008; 112: 3455–3464.
. Macrophage elastase kills bacteria within murine macrophages. Nature 2009; 460: 637–641.
. Inducible targeting of IL-13 to the adult lung causes matrix metalloproteinase- and cathepsin-dependent emphysema. J Clin Invest 2000; 106: 1081–1093.
. MMP12, lung function, and COPD in high-risk populations. N Engl J Med 2009; 361: 2599–2608.
. Airways surface liquid depletion causes MMP-12 dependent emphysema in bENaC-overexpressing mice. J Cyst Fibros 2009; 8: Suppl. 2, S53.
. Membrane-bound FRET probe visualizes MMP12 activity in pulmonary inflammation. Nat Chem Biol 2009; 5: 628–630.
. MMP inhibitors: glimmers of hope amidst clinical failures. Nat Med 2002; 8: 95.
. Development of musculoskeletal toxicity without clear benefit after administration of PG-116800, a matrix metalloproteinase inhibitor, to patients with knee osteoarthritis: a randomized, 12-month, double-blind, placebo-controlled study. Arthritis Res Ther 2007; 9: R109.
. Human neutrophil elastase-mediated cleavage sites of MMP-9 and TIMP-1: implications to cystic fibrosis proteolytic dysfunction. Mol Med 2010; 16: 159–166.
. In vivo suppression of neutrophil chemotaxis by systemically and topically administered tetracycline. J Am Acad Dermatol 1983; 8: 807–812.
. Doxycycline modulates nitric oxide production in murine lung epithelial cells. J Immunol 2006; 176: 567–572.
. Inhibition of MMP synthesis by doxycycline and chemically modified tetracyclines (CMTs) in human endothelial cells. Adv Dent Res 1998; 12: 114–118.
. The effect of adjunctive low-dose doxycycline therapy on clinical parameters and gingival crevicular fluid matrix metalloproteinase-8 levels in chronic periodontitis. J Periodontol 2004; 75: 106–115.